The copper test measures the copper blood level. What is a copper blood test? The copper lab test measures the copper blood level. Why is a copper level test important? The copper lab test is important as it helps check for abnormal copper levels. This Copper Blood Test is a blood test. The copper test, also known as a copper blood test, copper lab test and copper level test, measures the copper blood level. Copper is a trace element that is necessary for organ health and metabolism. Copper is a core part of various proteins and needed for joint and tissue health, red blood cells, macromolecule digestion and iron absorption. Copper also has anti-oxidant properties and works with the immune system to fight off infections. Copper is important in tissue health. In particular, it is vital in maintaining skin and blood vessel elasticity and in the formation of collagen. Copper also plays a critical role in energy production, immunity, gland function, and reproductive health. This copper blood test measures the copper blood level at a point in time whereas the copper RBC test measures the intracellular copper level to assess copper stores over a longer period of time. Low copper levels, or a copper deficiency, can lead to organ malfunction. Symptoms of copper deficiency include fatigue, eye problems, and numbness and tingling, anemia, and chronic infections. People who have had gastric bypass surgery are more susceptible to copper deficiency. High copper levels, or copper toxicity, can also be problematic, causing gastrointestinal disruption, oxidative damage and anemia. For advanced copper screening, this copper level test is sometimes ordered along with the ceruloplasmin test to assess how well copper is being stored in the body. To get a copper test near you, order online and get your blood drawn at the selected Quest Diagnostics lab. Once the copper lab report is ready, it will be available for download. No fasting is recommended before the copper lab test. 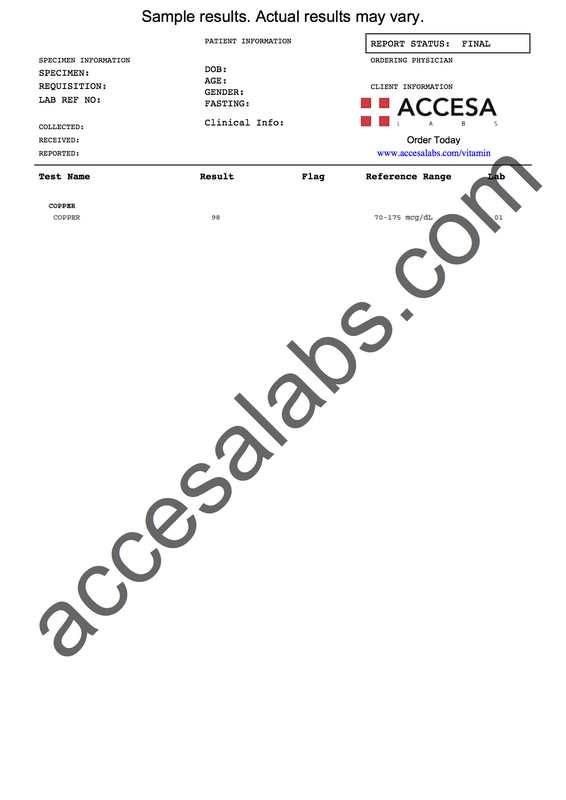 As can be seen on the sample copper lab report above, the copper blood level is reported as a number and can be compared to the reference range provided by the lab. This copper blood test is a component of the more comprehensive mineral blood test panel. Copper Blood Test at Guaranteed Prices.